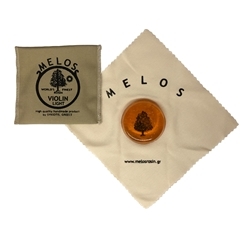 MELOS ROSINS are tested to "function" effectively under any condition, for every single instrument. Especially, violin, viola, cello and bass rosins, are produced in two types, "light" & "dark". The "light" type is used more in high temperatures (spring or summer), for "smooth" playing or for solo in chamber music. The "dark" type is used more in low temperatures (autumn or winter), for full-tone playing, in an orchestra, or for great solo concerts. One can also choose based on his/her right hands’ peculiarities and bow technique.